The “Jon Garbriel Method” was the first book written by this author. I read it and thought it was interesting but did not actively pursue it or the visualization that he provided. Now, that I am faced with this second book, I am more intrigued. 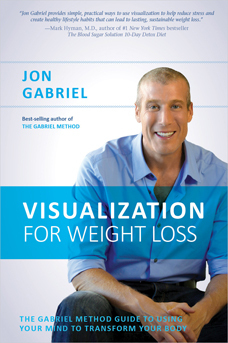 Jon uses visualization much in the way that Shakti Gawain suggests in her book, “Creative Visualization.” He has taken it one step further, however, and has made some excellent visualizations that look they would work. They encompass using white light and predominantly the navel as a focal point. Other areas include the forehead. Both of these are near important chakra points and so the visualizations are more powerful. Jon discusses stress, trauma and fear as factors in being overweight. It is not simply a process of calories in and calories out otherwise diets would work but they don’t. Dieting is an industry onto itself. The food industry system is into marketing processed foods that are cheap to produce and sustain on shelving and so not that good for the human body. The more raw and alive products with one ingredient is much more valuable to the body than products that have been laced with herbicides, pesticides, fungicides, chemicals and dyes. Jon believes in visualization and offers a 16 week program near the end of the book in which he uses a variety of topics to serve as focal points for morning visualization sessions. In the evening, there is a visualization that you can fall asleep to. Overall, I found the book to be informative because he backs up his work with scientific researched work which is nice to see. The most compelling part of the story is Jon’s own transformation. He went from plus 400 pounds down to 186 pounds. Plus, he does not have extensions of lose skin all over the place. In fact, he looks as if he never was fat. This is compelling evidence to me and although it may be anecdotal evidence, it is pretty convincing to me and serves as a ray of hope.